Kaziranga National Park is situated in one of the ‘seven sister states’: Assam, India. It had been 2 years since the last time I had visited an Indian jungle and I couldn’t wait to visit the park—one of the few remaining lands of the ‘Indian one horned rhinoceros’. Although I was very excited to see the rhinos, I was eagerly looking forward to seeing an even larger mammal: The Asiatic elephant. I have always had a soft spot for elephants and was extremely excited to see them. It was a long journey of about almost 15 hours from Pune to our destination and we decided to spend some time in Guwahati meeting a lady called Nandita Hazarika. She and her husband run a rescue center for these animals known as ‘Pygmy hogs’. I had never seen these animals before and after a small discussion with her got to know that they are critically endangered animals and only around 150 individuals remain in the wild!! Their decline is mainly caused due to their habitat being degraded by humans through processes like agriculture, overgrazing and fire. They were very cute little animals scurrying around and feeding on some specific kind of grass which was brought from the forest for them. Seeing these animals decline in the wild got me thinking how human actions are causing such harmless, innocent and beautiful animals to be subjected to death and ongoing decline. 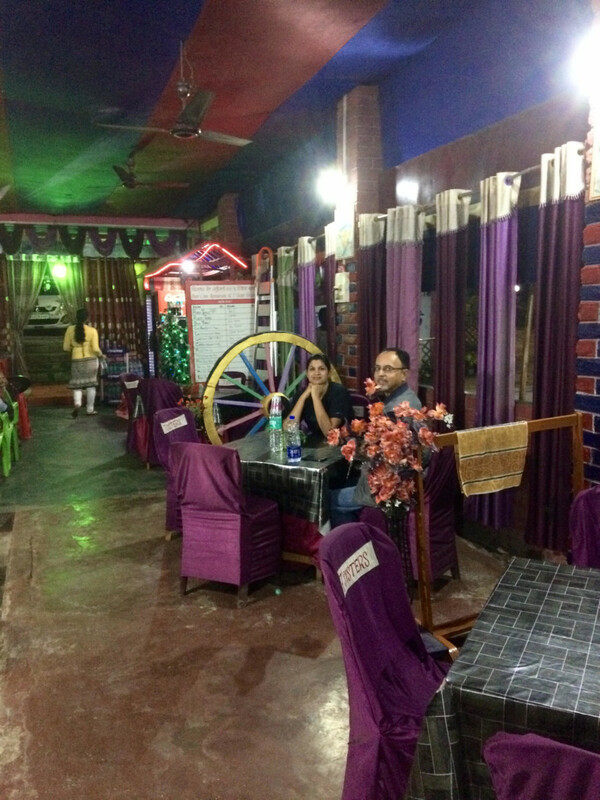 What is travel without a true taste of the local cuisine, so on our way to Kaziranga we stopped to eat some authentic Assamese food at ‘Paradise restaurant’. 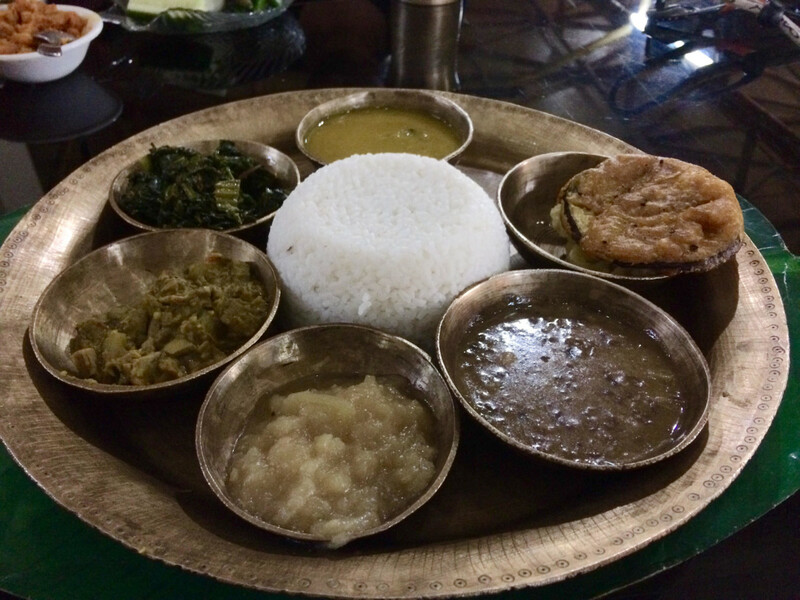 The Assamese thali included two varieties of dal, raw papaya vegetable, dry Fenugreek vegetable and rice. Rice is preferred in Assam over roti / bread which went very well with all the vegetables that accompanied it. They use ‘Naga dhaniya’ here in their food which gives a particular flavor to the food which I had never tasted before and I must say I really enjoyed it. Once back in the car all tucked in, we decided to stop only once for tea. It was around 6 pm and the sun had already set. We stopped at this small food joint called the ‘Seven Sisters’ and as we entered the hot-pink and parrot-green colored space, we saw a family enjoying a movie together. The place had a different feel to it which I had never experienced before. We ordered some chai and were given delicious small fried ‘pakodas’ complimentary along with this. In a world where money dictates anything and everything these small complimentary pakodas were a pleasant surprise. Now onto our final destination. We were all pretty exhausted by then and were eager to reach the resort. The highway which we were on cuts through forest patches and is an important wildlife corridor. Boards warning the vehicles of elephants and other wildlife crossings were put all along the highway. We were just discussing how many times elephants are seen crossing the road when we suddenly saw a herd of elephants waiting patiently on the left hand side of the forest patch to cross. I was beyond excited to see these gentle giants. My first wild elephants after almost two years, and that too not on a safari but in the darkness along a highway. I hoped that the family crossed the road safely. Highways cutting across forests which have vehicles blazing past them disregarding the speed limit, result in a large number of road kills. It really is a dangerous world filled with humans that these animals live in. Next morning, we woke up fresh and ready to experience the jungle. I have many a time observed when I visit these National parks in our country that most people enter the park with expectations of mostly spotting the tiger. Although the tiger is no doubt a very beautiful animal, there is so much more to experience in the jungle. So I went on my first safari just excited to experience whatever comes my way and to thoroughly enjoy my time in the jungle. 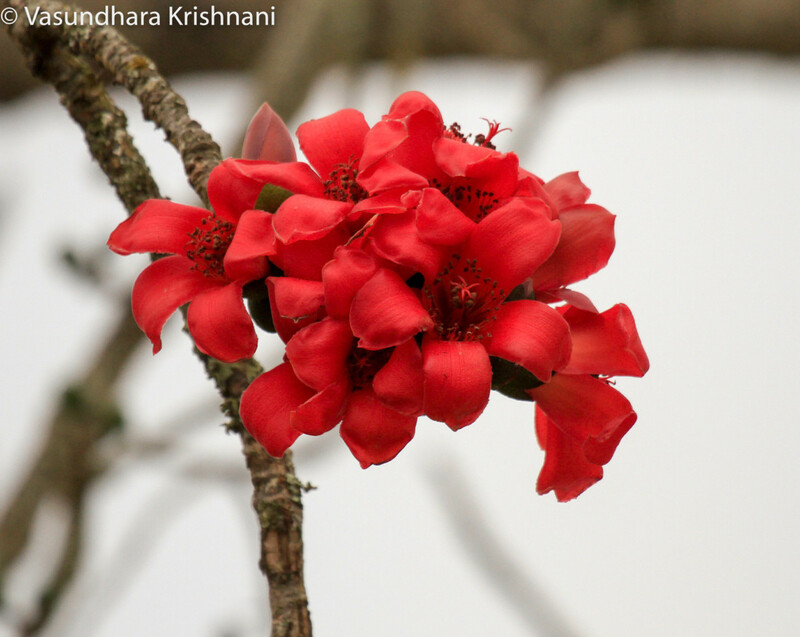 The whole jungle was blooming with red silk cotton trees, whose flowers are a vibrant red color. It was such a refreshing site. 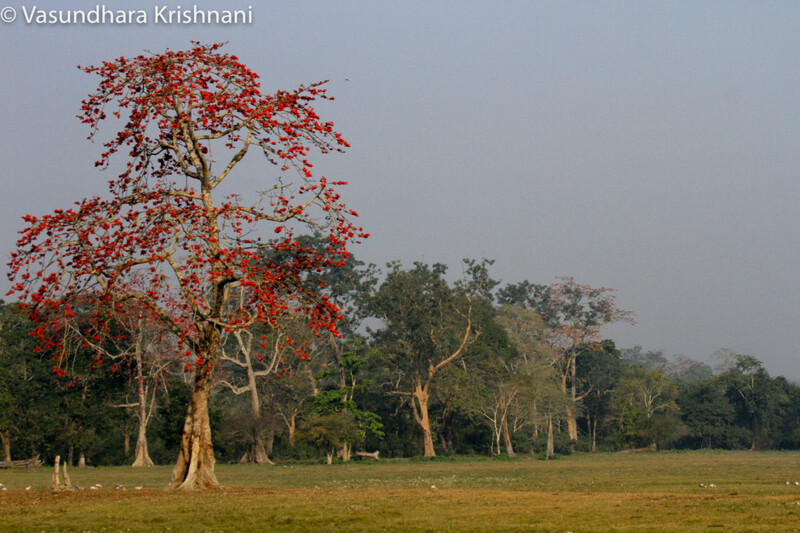 The tourist region of Kaziranga National park has been divided into the Western, Central and Eastern zone. On our first safari, I was lucky to add few bird species which I had never seen before in my bird list. Out of these the red breasted parakeet was my favorite. The color and the beak of this bird were absolutely gorgeous. 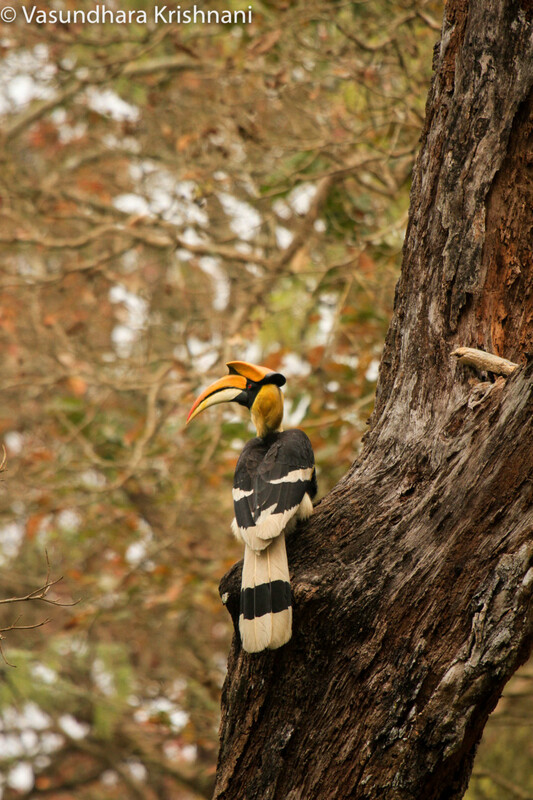 Another beautiful bird we saw was the Great Indian Hornbill. It is an enchanting huge bird. Even the sound of this bird flying is extremely mesmerizing. Nature is so beautiful. We just need to stop and look around and we realise that there is beauty in everything we see in the natural world. We spotted the famous Indian rhinoceros also known as the greater one horned rhinoceros. They are stunning creatures. Their skin which almost looks like a suit of armor reminds you of pre historic creatures which must have roamed the earth centuries ago. 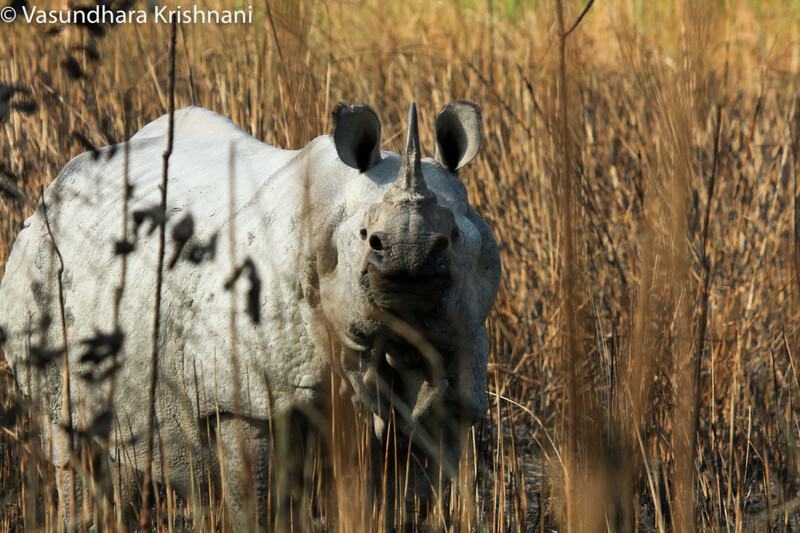 India consists of one species of rhinoceros and only around 3500 individuals remain in the wild. The Indian Rhinoceros is listed as vulnerable in the IUCN red list which as their populations are under constant decline due to habitat loss and fragmentation and are under constant threat of poaching. In China some people believe their horn to have some medicinal properties because of which these animals are being illegally hunted for their horns. It really is something to think about isn’t it? That for some peoples selfish benefit which is not even proven to be true, we are taking parts of their body from them and stealing their lives away. Before we knew it we were on our last safari, and the jungle was encompassed in black clouds. The rain gods had generously showered their blessings the previous night. The whole forest had transformed overnight from a hot, dry and dusty forest to this freshly bathed jungle. The forest was surrounded by the smell of fresh mud and rain water, the leaves were freshly washed and were a shade of brighter green, and the birds seemed to be sleeping in that morning as the forest was extremely silent. We drove around for a while and before we realized it started pouring. We rolled down the tarp of the gypsy and could barely see anything outside, when my friend exclaimed “Tiger, Tiger”!! We quickly popped our heads out and saw two beautiful tigers sitting on a patch of open forest. This was a courting pair enjoying their romantic day out on a rainy day. We were so thrilled to see them and before we knew it the female stood up and walked back towards the road we came from, and the male followed. We were so thrilled at this spectacular sight! 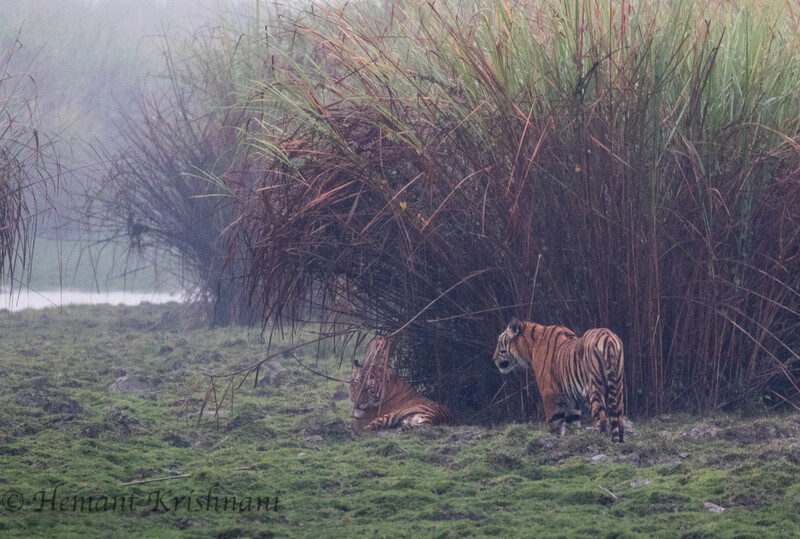 We got to know from the naturalist that the tigers in Kaziranga are not accustomed to vehicles and tend to shy away. It was indeed a lucky moment to see a Kaziranga tiger in its home! The feeling I get while exiting the jungle gate for the last time is always the same—content but sad. I can never get myself to be prepared to leave behind the peaceful, undisturbed jungle for the urban jungle consisting of traffic and concrete. However going through the pictures and just remembering the sounds and smell of the forest can bring you back in one instance. The energy and positivity that you feel once you have visited the lush green jungles of India filled with extraordinary animals is priceless. As are the lives of these beautiful animals—priceless! India’s premium wildlife and natural history web portal and magazine It was somewhere out there in the wilderness that an idea was born. An idea called Saevus. A dream, a vision to bring India’s amazing bio-diversity to every home. To celebrate the bold, beautiful and dynamic India, much of it unseen and unexplored. It was the coming together of seasoned entrepreneurs, ace photographers, naturalists, and storytellers to captivate your imagination and arouse your consciousness.